We in NCHA say there is such a site. The site is the marvellous 150 acre parkland around Connolly.The cabinet must choose it . “If [our emphasis] the National Children’s Hospital were to be located on the St James’/Coombe campus, we feel that it ought to be physically attached to the Coombe Hospital”. Please note the above excerpt from a letter by 40 Crumlin Hospital consultants http://www.irishtimes.com/newspaper/letters/2012/1101/1224325979425.html.The letter was written to emphasis the priority that the children’s “must be physically linked to a maternity hospital”. The letter does not suggest that the Cabinet should exclude considering a different adult hospital as the preferred site (though maternity co-location from ‘day one’ is a must, whatever site is chosen). The Dolphin report leaked to RTE today shows the paternalism and self interest of adult hospitals is still rampant. Apparently, the report states that adult hospital co-location is a must while maternity hospital is an optional extra. That is last century medicine. When the 3 children’s hospitals are consolidated into one National Children’s Hospital, the new hospital will out perform any adult hospital in breadth and depth of service to its patients. It will not require interference by adult services and personnel untrained in paediatric care. Do ‘they’ not know that, for example, Our Lady’s Children’s Hospital Crumlin has over 30 specialities (more than any adult hospital). Adult hospitals do not have children in them. Maternity hospitals do. Clinical need demands that Maternity hospital co-location with the new children’s hospital must take priority over adult hospital co-location. Dolphin is wrong. We understand your grave responsibility in deciding, possibly on Nov 6th, re location of the National Children’s Hospital. We are happy to discuss or direct you to expert opinion – Media contacts. “…We believe there are two choices in front of the government and political considerations will undoubtedly have a role in the ultimate determination. This would place the NPH on a large accessible peripheral greenfield site which would not restict its size or configuration. 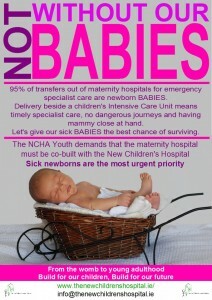 A reconfiguration of maternity hospitals would transfer one of the existing facilities to the same site (Given the lesser cost of building on such a site, NCHA recommends that the option of building the maternity hospital at the same time as the children’s hospital be seriously considered). Later, the other components of an academic University Medical Centre, including an adult hospital, would join the site and the latter would gradually absorb all the national tertiary specialities currently spread around the city. This is the only way we will ever produce the adjacency of NPH with all the appropriate adult medical specialities as political, logistical and space constraints make their transfer to any single existing adult campus very unlikely, even if one were selected as the new home of the NPH . This plan, “The Long Term Strategy” would ultimately produce the best configuration but would require long term strategic vision and thinking by the DoH and government. Too often, this has been the Irish strategy. This would place the NPH on an existing campus. While this would achieve some measure of co-location, we know that no existing campus delivers all the relevant synergies and that, even if it did, these synergies are less important to the functioning of the new hospital than adequate size, appropriate configuration and reasonable access. This makes point 1 above, Children First, the most important criterion in arriving at a conclusion. Fundamentally, the NPH must be the right hospital for children – from the womb to young adulthood. That has sometimes been forgotten in this process. ” ENDS. Read the full NCHA Written Submission, which accompanied our oral presentation to the Dolphin Group, at the 2 May 2012 entry on the “Independent Review 2012” page of our website. The Minister of Health, James Reilly welcomes receipt of the Dolphin Report. NCHA’s recently formed, tech-savvy, Young Members section is running the social networks for the NCHA. Rachel Lavin is the NCHA Youth rep. on our central committee. Read an article by her here. Do keep in touch via Twitter and Facebook. Spread the word. Thank You. Pat Kenny , RTE Radio1, today discussed greenfield options for the NPH. Listen to a mother’s wish for the new hospital. Dr Fin Breatnach of NCHA outlines our organisation’s position. 1)NCHA met with four members of the Review Group on the 2nd May, 2012. We were very courteously received by Dr. Dolphin. Mr Martin, Mr. Collins and Prof. Smith. 2)Visit the ‘MEDIA – Newspaper’ page on our website for the latest articles about the ongoing location debate.